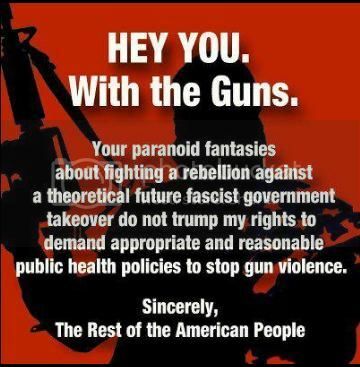 In The Wake Of Newtown, Fear Mongering Is At An All Time High! Wondering why you cant go anywhere without bumping into a ranting, screaming crazy person nattering on about Obama taking their freedom away? Its Fox acid. Come down the rabbit hole with a recent Fox News article titled, UN gun control treaty will reveal gun laws Obama really supports to break down the anatomy of the Fox News Obamas coming for our guns lie. Turns out, the very narrow ledge of reality they preach over is buttressed on nada but feelings that lead to vague conspiracy theories. "The Obama administration is undoubtedly the most hostile administration to gun ownership in US history, with Obama having personally supported bans of handguns and semi-automatic weapons before becoming president. And remember the recent scandal where the Obama administration was caught allowing guns go to Mexican drug gangs, hoping it would help push for gun control laws." Okay, so wow. If you believed all of that, youd be paranoid too. Trouble is, this is a lie upon a lie upon a lie. The first link proving Obama is the most hostile administration on gun ownership goes to a John Lott blog post titled, President Obamas Anti-Gun Agenda Shows No Sign of Stopping. Only Lott shows no signs of Obamas actual policy-based anti-gun agenda. He cant show policy because its not true.